For the past two Fridays at Whatcom Falls Park we’ve been diving deeper into tree identification. 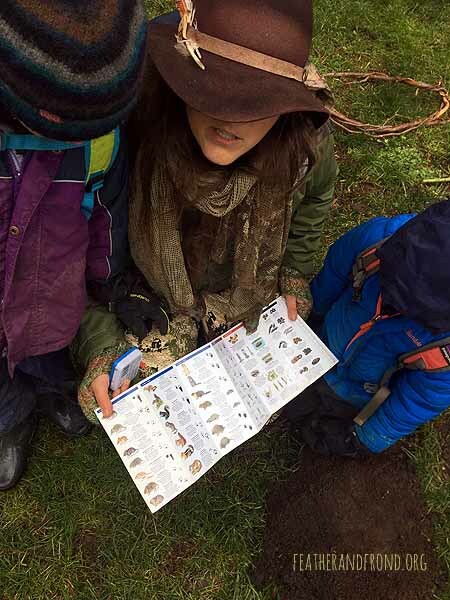 The Fox Walkers have been learning how to identify the abundant Douglas Fir and Western Red Cedar trees. Playing Fire in the Forest! Skye sharing the story of how Douglas Fir cones got their "mouse tails"
"Flee Mousey Flee to the Douglas Fir Tree!" This huge rock was rolled over to our Parkour course! 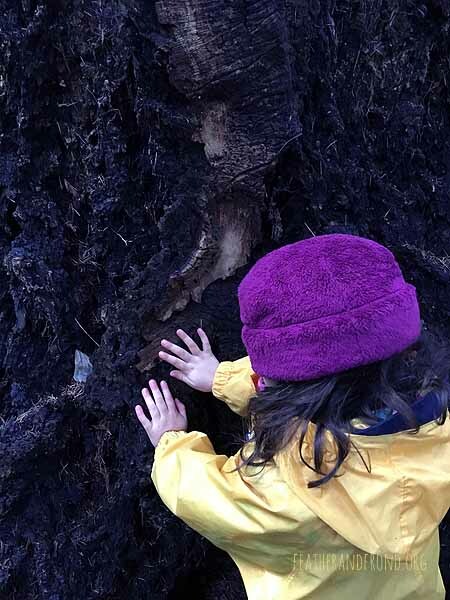 Is this tree bark wrinkly like Cedar or thick like Douglas Fir? 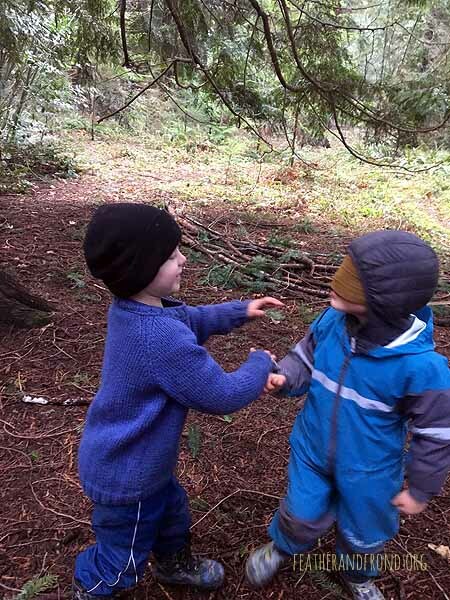 To help with Douglas Fir identification, Skye shared a story about some little mice who escaped a forest fire by climbing into the fire-resistant bark of the tree. To this day you can still see little "mouse tails” hanging out of the scales of the the Douglas Fir cones, and on the underside of the scales you can see a deer track, as Deer was trying to escape the forest fire as well, but couldn't fit his big feet inside the Fir cones! The distinctive and thick "bacon-like" bark of the Douglas Fir tree is also a helpful way to identify the species. For Western Red Cedar identification, I shared a puppet show about a man named Thuja who was always very generous and helpful toward others. He worked so hard to help his people, all day and everyday. His skin eventually got red and wrinkly from so much time working in the sun, and this hands became scaly from all of his hard work in harsh weather. He eventually got very old. When it was time for him to pass, he lay down to rest and became the Western Red Cedar tree-- also known as the Tree of Life, for its immense generosity in providing the indigenous people with strong fibers for clothing, rope, instruments, houses, canoes, totem poles, and fire-making materials. You can still notice the wrinkly red bark and the scaly fronds of the Cedar tree, which remind us of the wrinkly red skin and scaly hands of generous Old Man Thuja! In order to deepen our identification skills and further explore these trees, we played a variety of games, such as “Run Mousey Run” (in which the “mice” could safely escape from the “forest fire” only if they were touching a Douglas Fir tree) and Meet-A-Tree (which required using our Raccoon hands to identify trees through our sense of touch, while blindfolded!). Some other highlights of our time together over the past two Fridays included creating “animal tracks” in some mole hills, playing Fire in the Forest, riding the Cedar horses at Heart Home, playing Jays and Chickadees, setting up a new parkour course with some freshly cut logs that we found, and practicing using our Owl Eyes and Deer Ears during Sit Spot time. 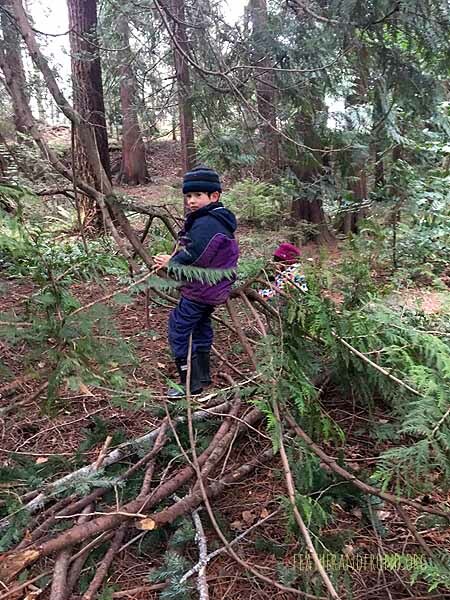 Next time you’re wandering with your kiddo through the forest, ask him or her to point out a Douglas Fir and/or a Western Red Cedar tree. I have a feeling that they’ll point you to the right ones!